Assalamualikum Rahmatullahe wabarakatuhu !!! 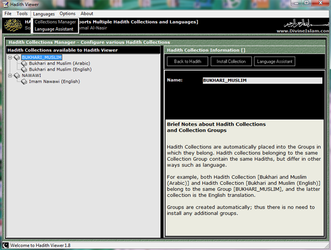 :) We happily announced to all that, we have created first time in the word "Hadith software" (Offline use) which consist 3 language (Arabic+English +Bangla). Now this is our 0.2 version we have- Sahih Bukhari (Complete); Sahih Muslim (Complete); Riyad us Saleheen (Complete); Suunane nasayee (Partial); Bulugul Maram (Complete); mam Nawawi's 40 Hadith (Complete); SahihHadith Qudsi (Complete); added Alhumdullilah. This software is a chm format.Specialization of this soft are- 1) This Is Chm format. 2) English tree & child menu. 3) Consist 3 Language Arabic+ Bangla + English. (First time in the world). 4) Powerful Search options (windows help). 5) Add your favorite Hadith. 6) Sahih Bukhari, Sahih Muslim & Riyad-us-Saleheen. 7) Commentary of Riyad-us-Saleheen. 8) Quick Navigation arrow. 9) Easily copy & paste with (Unicode font). 10) Easy print options. 11) Any OS can be run. 12) Moren then 20,000 hadith, 13) Majority hadith classified Sahih, D'aif, Hasan & Munkar. (we are working on that issue). 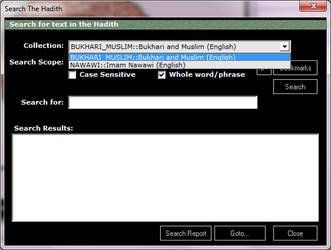 This feature enables you to find the preferred spelling for a given word. By typing in your spelling, it will return the correct one. 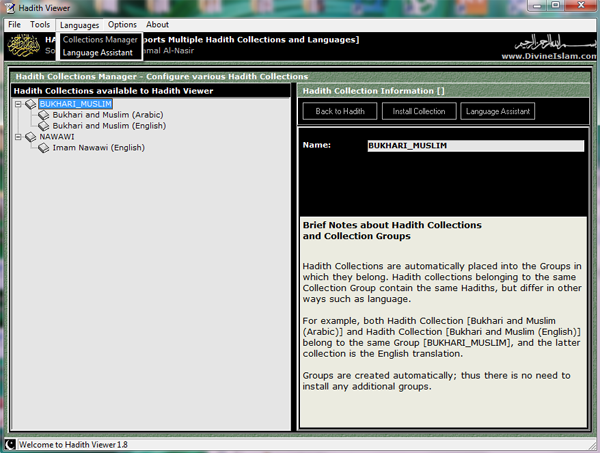 Hadith Viewer supports various different types of booksmarks which allow you to reference a particular point of information within the program or hadith. Your bookmarks are saved automatically and are preserved when you exit and re-enter the program. A useful selection of snippets of information and usage tips are provided for both novice and more seasoned users.